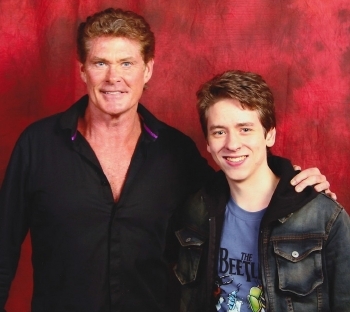 I met David Hasselhoff at the Memorabilia show held at the Birmingham NEC in November 2012. He was a popular, and very friendly guest. of German descent. He has a four sisters, Daine, Joyce, Lisa and Jean who is an actress. Due to his father's work, the family moved frequently. As a boy, Hasselhoff lived in Jacksonville, Florida (where he began taking acting, singing and dancing lessons), and later in Rothesay, Scotland, where he attended Marist High School. After returning to America, he graduated from Lyons Township High School in La Grange, Illinois, before further studies at Oakland University. He went on to study at the Academy of Dramatic Arts in Chicago, and later at the California Institute of the Arts, all in pursuit of his ambitions to be star of Broadway musicals. six episodes of this soap, which has aired in America for forty years since 1973. Hasselhoff whose career was about to achieve superstar status. The series was nominated for a Primetime Emmy in 1983, in the Sound Editing category. after only one season because of low ratings. Hasseloff was convinced that the show had the potential to be a huge success, and invested his own money into reviving it. It turned out to be an astute move. The series restarted in 1991 and quickly gained huge popularity, allowing Hasslehoff to buy the rights for the show from NBC. It ran for ten series until 1999 as Baywatch, and then until 2001, with setting and cast changes, as Baywatch Hawaii. Watched in 140 countries, it is listed in the Guinness Book of Records as the 'most watched show' with 1.1 billion viewers. A far-less successful spin-off series was the 44-episode series Baywatch Nights (1995-97), with Hasselhoff's character, Mitch Buchannon, investigating and solving a variety of crimes which are related to the beach, like smuggling. With so much Baywatch involvement, it is not surprising that Hasselhoff had little time for other productions. He made several TV movies though, including The Ring of Musketeers (1992); Avalanche (1994) and Gridlock (1996) in which he played a helicopter-flying New York traffic cop. 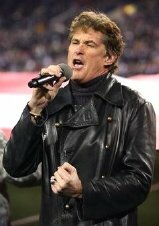 David Hasselhoff has always fancied himself as a pop singer! Swiss pop charts with his single Looking for Freedom. He sang this song at a star-studded New Year's Eve concert at the Berlin Wall when it was brought down in 1989. 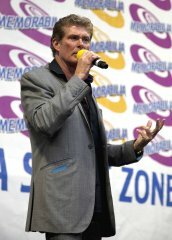 All in all, Hasselhoff has recorded eighteen albums and sixteen singles, and whilst most of his success was in German-speaking Europe, his song Jump in My Car, and its accompanying video, reached No.3 in the UK charts in 2006. This was after an internet campaign began aimed at getting it to the No.1 spot. 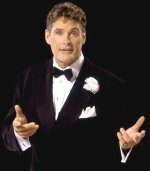 As well as film and TV work, Hasselhoff had a brief music career in the late 1980s and early 1990s. He had long dreamt of becoming a pop star and this came true in 1988 when he met the German composer and record producer Horst Nussbaum, better known as Jack White. The following year, he had a No.1 hit in the German, Austrian and Swissp. was the cult star most searched for on the Internet. or a 'celebrity'. He was a co-judge on NBC's America's Got Talent (2006); he was a featured guest in a Volkeswagen commercial (2008); he guest hosted professional wrestling's WWE Raw in London (2010) and he appeared as a contestant on Season 11 of Dancing With the Stars (2010). In 2011, he took on the role of a judge in the show Britain's Got Talent. Replacing Piers Morgan, he appeared alongside Amanda Holden, Simon Cowell and Michael McIntyre. Finals, the Olympics, the Indy 500, and the Kentucky Derby. In 1996, Hasselhoff was given a star on the Hollywood Walk of Fame, at No. 7018 Hollywood Boulevard. Because of his long association with pop music in Europe, in 2012 he was made into a waxwork for Madame Tussauds in Vienna. Hayley (b.1992) who is now an actress. 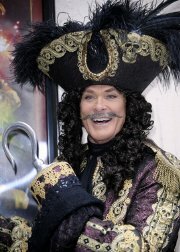 In 2006, Hasselhoff announced he was filing for divorce, citing 'irreconcilable differences'. 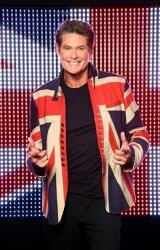 Hasselhoff's current girlfriend is Hayley Roberts from Wales, whom he met in 2011 when she asked him for his autograph at the Britain's Got Talent auditions, held in Cardiff. He has proposed to her several times (including once on the top of Sydney Harbour Bridge!) but she has always turned him down - so far! (2006); Anaconda III (2008) and Dancing Ninja (2010).